Metallic Paper: A Power Source for Flexible Wearables? Sweat is a surprisingly rich seam of biological information that can help track prevalent health metrics such as blood glucose and stress levels. It can be used to detect blood alcohol levels too. However, getting samples of the fluid is not as easy as it sounds. Typically, people don't have as much conscious control over supplying a sweat sample as they might have with some other bodily fluids. Health tracking through sweat collection and analysis could be more convenient and amenable to everyday life than traditional methods. Accordingly, many bioengineers are now working to develop the perfect sweat-sensing device. These devices are also often integrated with electronics such as wearables. Unfortunately, sweat-sensing in the real world is beset with drawbacks and problems. The sweat needs to be collected from the skin's surface in an appropriate location such as the upper arm. Therefore, the participant needs to produce sweat in some way, say, for example, vigorous physical activity. But anyone who has ever worn a health tracker (or watched a certain episode of UKTV's comedy show, Taskmaster) can attest that this could create more problems than it solves. The physical forces involved in exercise can easy displace a wearable device out of its position on the body, as can the resultant sweat itself. An alternative method of sweat collection involves the actual induction of sweating through pharmacological means. In other words, the receptors associated with sweat gland control are activated in order to expedite sweat collection. As these receptors are cholinergic in nature, the drugs involved are usually either carbachol or methacholine. These two stimulants are often chosen because their effects are prolonged and it takes a long time for them to break down in the human system. However, cholinergic receptors have many other functions throughout the body. Therefore, if the drugs get into the bloodstream beyond the target areas, it could result in potentially dangerous side effects. Therefore, bioengineers are trying to get around this problem by delivering drugs in hydrogels that are likely to be confined to the epidermis in question. The gels are also paired with iontophoretic devices, which function by emitting a tiny electrical pulse through the skin. This pulse, in turn, causes a specific amount of the drug to migrate towards its receptors. So, the gel can come with doses that are about a hundred-fold greater than those needed at any one time. They can also be used to induce sweat production several times in a 24-hour period, which may be necessary for constant monitoring. However, despite these innovations, sweat-sensing devices may not have reached truly appreciable levels of efficiency and efficacy yet. The products do contain biosensors to analyze the sweat that is produced as a result of drug-related induction. However, they may become obscured by the hydrogel or have the sweat samples excessively diluted by the same. Therefore, the accuracy and usability of the entire system may still not match up to clinical or commercial expectations. In addition, the drugs incorporated into these sweat-sensing solutions can escape iontophoretic control through passive diffusion. This problem occurs when the stimulant molecules 'leach' out of their gel and reach their skin receptors through various physicochemical events. With this, systemic side effects can increase and also the risk that patients may become tolerant or resistant to the intended effects over time. A team of researchers, from the University of Cincinnati and Chongqing University in China, set out to address the problem. They started by investigating the various types of new and improved filtration systems to sort the desirable samples from other substances, such as the hydrogel. 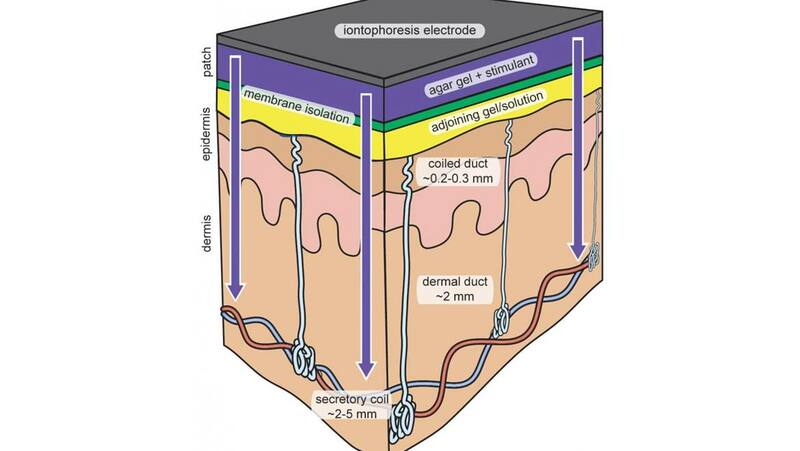 The membranes were also intended to avoid passive diffusion, by retaining carbachol molecules until the actual iontophoresis was to be enacted. The team compared membranes with either nanometric pores or larger ones (which were manufactured using a track-etching technique). They found that the track-etched membranes reduced passive diffusion to 2.17 μmol per square centimeters, whereas the nanopore variants reduced it to 3.56 × 10^−2 μmol/cm^2. The nanopore membranes also retained up to 99% of the total gel carbachol concentration, in an in vitro study, indicating that it was capable of sorting sweat from potential contaminants with great efficiency. The researchers moved on to an in vivo study, in which small discs that incorporated the better-performing nanopore membranes and carbachol gel were tested out in three healthy human volunteers. The team reported that these devices stimulated up to 94 sweat glands per square centimeter under active iontophoresis, compared to about 33 in the absence of iontophoresis. It was concluded that although the nano-membranes were capable of the effective separation of sweat and carbachol, it could also benefit from further development and optimization. Sweat-sensing may be part of the future of long-term healthcare monitoring for patients with conditions such as diabetes. However, the devices that facilitate this process are still at relatively primitive levels of development as clinical or consumer products. A team of researchers from the US and China has tried to enhance the development of sweat sensors with their study on improved membranes to prevent the loss of sweat stimulants from such a system, and the contamination of eventual samples. This advancement may lead to wearables that can, for example, measure how stressed (or, possibly, how drunk) you are in the future. P. Simmers, et al. (2018) Membrane isolation of repeated-use sweat stimulants for mitigating both direct dermal contact and sweat dilution. Biomicrofluidics. 12:(3). pp.034101. J. Kim, et al. (2016) Noninvasive Alcohol Monitoring Using a Wearable Tattoo-Based Iontophoretic-Biosensing System. ACS Sensors. 1:(8). pp.1011-1019.